Damn you Austin! Why do you do this to me? I was all prepared to focus on The Rosebuds show at The Parish tomorrow night. I love their latest LP, Loud Planes Fly Low and they always put on a fantastic live set. Also, I haven't been to the Parish in sooooo long because their bookings have been pretty shite lately. I like it when C3 Presents and/or Transmission Entertainment book shows at The Parish because the sound and lights are fantastic but I feel like whoever manages that joint must be hard to deal with because the good bookings have been more and more infrequent. Remember when Grizzly Bear played there? Or Bat For Lashes? In any case, tomorrow night with The Rosebuds, you really can't miss. Not to mention, one of my favorite up-and-coming artists, Other Lives are sharing the bill. I had the pleasure to see these troupe of Oklahomians(?) Oklahomies(?) Oklahomites(? )...Okies, open for The Decemberists at Stubb's this spring and I fell in love. Their latest album is called, Tamer Animals and it's out now on TBD Records, which you might know as the label that puts out all of Radiohead's latest LP's. Tickets for tomorrow night's show at The Parish are STILL available and will only put you back $12. 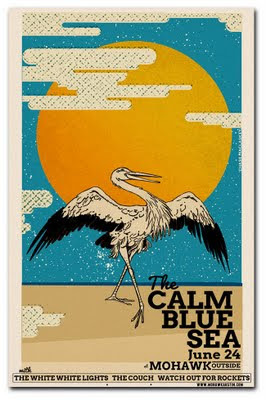 So, I started to say above the break, I was focused on The Rosebuds show at The Parish, when I noticed one of my favorite local bands The Calm Blue Sea is playing the Mohawk's outside stage tomorrow night. This show as originally scheduled to be at ND, which is a lovely venue but now that it's at the Mohawk it's become more irresistible. I love the band, I love the venue. The only thing that MIGHT save me, is if the show at The Parish has a later start time than the show at the Mohawk but I don't really believe that to be true. So I may have to rip the baby in half via Solomon. The info I have shows The Calm Blue Sea playing the Mohawk at 11pm tomorrow night. The doors for The Parish show open at 7pm but I just really don't think that show will be over by 11pm. Just 'cause the doors are open doesn't really mean the show is starting within the hour...necessarily. Keep an eye on my Twitter feed and I'll let you know what I know when I know it.